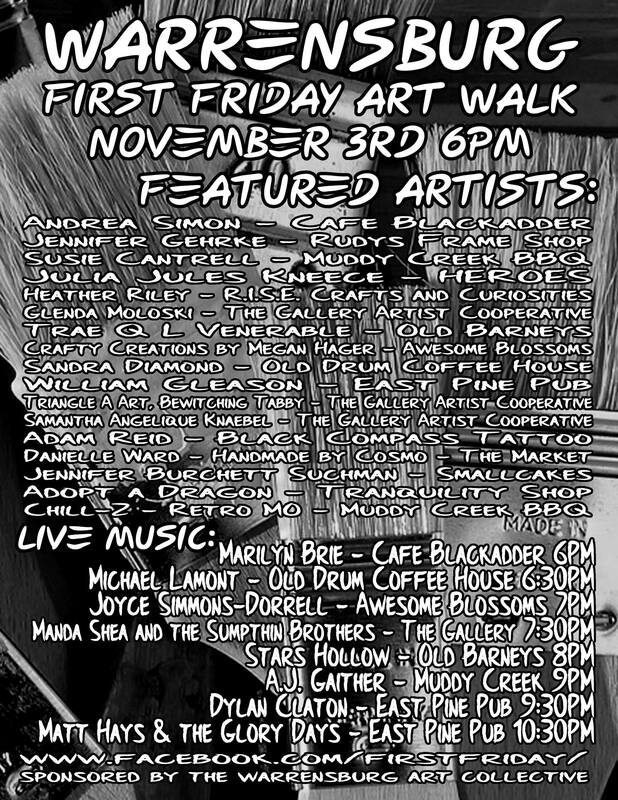 The Warrensburg First Fridays Art Walk returns this Friday with a dozen venues and more than 50 artists, creators and musicians involved. With temperatures set to be mild this weekend, organizer Jay Linhardt said this month’s Art Walk could see a shift indoors, a break away from the typical setup of vendors on the sidewalks of downtown. After an average month in October, Linhardt expects to see more people downtown this month with a stronger music lineup to add to the draw. Despite middle of the road numbers in terms of patrons visiting the Art Walk last month, Linhardt said it seems the local art community is really coming together. The success of events such as the Art Walk really hinges on the community at large coming together. As events spring up and artists from different groups come together, which benefits groups such as the Warrensburg Arts Collective, the Warrensburg Arts Commission, and more. Linhardt attributes those successes to the people who make up the groups and host events. Visitors downtown are encouraged to grab a schedule and stop at each business hosting musicians and vendors – buy some art, tip the band or buy a CD. Browse the retailers and enjoy a beverage. All of this keeps the Art Walks going. This month’s Art Walk includes a feature of Sandra Diamond at the Old Drum Coffee House which includes a lot of new art. AJ Gaither is a one man band performing at Muddy Creek BBQ, and Manda Shea and The Sumpthin Bros. are at The Gallery Artist Cooperative, which is a surprisingly great music venue – it should be a unique set. The event kicks off at 6 p.m. Friday, Nov. 3 in downtown Warrensburg. For more information, follow the Warrensburg First Fridays Art Walk on Facebook here.